Due to the nice upgrade offer from Pixel Farm (around 100€ Upgrade from PFHOE V2.2 to PFMATCHIT), I just checked PFMATCHIT 2013 with Carrara 8 64 bit. 1. I used the new 2013 Node "Simple Track and Solve" in PFMATCHIT. This gives similar results as i had in PFHOE. Maybe I have not yet the understanding of the manual node capabilities, but the manual nodes gave me a quite different and a much bumpier camera path. 4. The footage was saved as sequenced png images. 6. Use the Camera Modifiers Point at "Interesting Point Node" and Track on "Camera 1-2 Node" on your scene cam. 7.In the Backdrop, load the footage saved in Step 4. But load it explicit as "Sequenced png"! Jump to the start of the animation and select the first png, then jup to the end of the animation and select the last png. Depending on your test objects in Step 2, you can construct some shadow receiving planes and position your 3D objects and animate them. 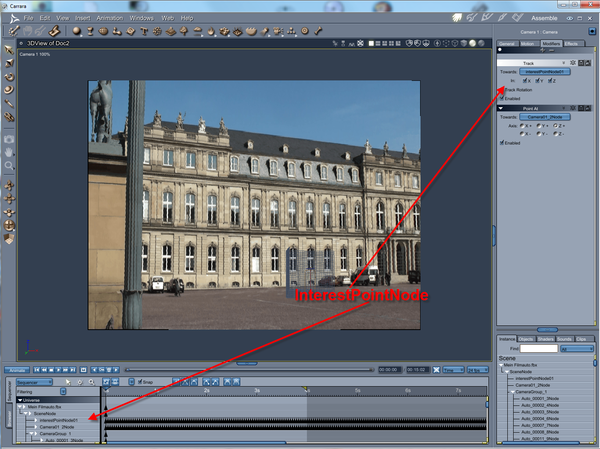 Now render your animation, save it in a standard file format and add sound and video effects with a video cut software. This is awesome. Out of more curiosity, I decided to check out this Pixel Farm: MatchIt to see what all it does, which is just as explained in the original post. Very useful stuff. Seems like it would take a lot of the irritation away from such endeavors. The fbx format is quite useful. But quite buggy in early Carrara versions. It works in 8.1.